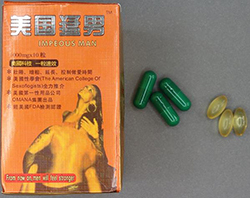 Impeous Man capsules pose a serious risk to your health and should not be taken. the capsules contain the undeclared substance phenolphthalein. Consumers are advised that sildenafil and phenolphthalein are both prescription-only substances in Australia. Phenolphthalein was withdrawn from sale on many markets in the late 1990’s due to concerns over its carcinogenicity with long term use. The supply of Impeous Man capsules containing undisclosed sildenafil and phenolphthalein is illegal. Impeous Man capsules have not been assessed by the TGA for quality, safety or efficacy as required under Australian legislation, and the place of manufacture is not approved by the TGA. Stop taking Impeous Man capsules and take any remaining capsules to your local pharmacy for safe disposal. The TGA is working with the Australian Border Force (ABF) to help stop future shipments Impeous Man capsules from entering Australia.